Give the gift of Belly Bliss! The gift that fits everybody and is sure to delight! 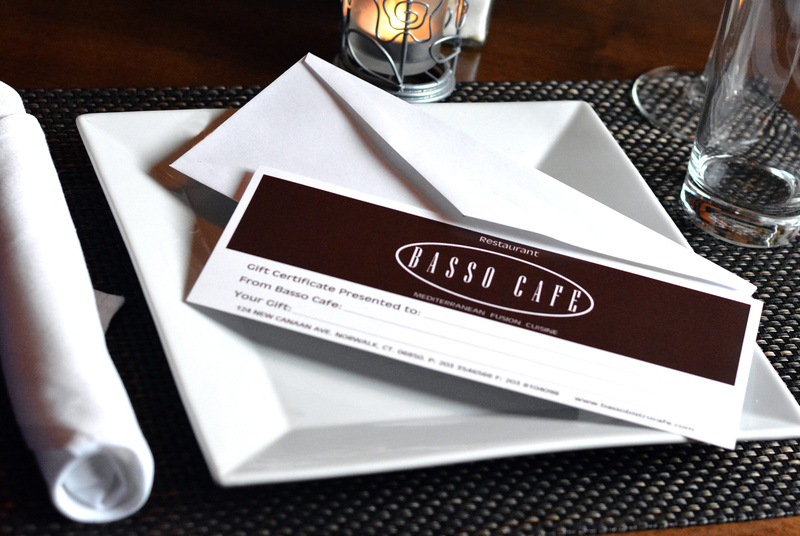 Basso Cafe Gift Certificates are available for purchase at the restaurant, or right here, online. We have two denominations available, $50 and $100. Most orders ship out the same day they are placed. Life is too short to eat bad food. Choose delicious! Terms and Conditions for All Gift Certificates. The following provisions apply to all Gift Certificates. Gift Certificates have no cash value and are not redeemable for cash at any time. Gift Certificates are for personal (non-commercial) use only. Gift Certificates may not be applied to previously placed orders and cannot be combined with other promotions or offers. Unauthorized reproduction, resale, modification, or trade of Gift Certificates is prohibited and may result in their cancellation. Basso Cafe is not responsible for lost, stolen, damaged, or undeliverable Gift Certificates, including those that may be lost in transmission. Gift Certificates cannot be returned for a refund. All Gift Certificates are Final Sale. Basso Cafe won't be responsible for lost, damaged, or stolen Gift Certificates. Gift Certificates cannot be used to purchase an eGift Card or a Gift Card. Basso Cafe MAKES NO WARRANTIES, EXPRESSED OR IMPLIED, WITH RESPECT TO PROMOTIONAL CERTIFICATES, INCLUDING WITHOUT LIMITATION, ANY IMPLIED WARRANTY OF MERCHANTABILITY OR FITNESS FOR A PARTICULAR PURPOSE. Any attempt to redeem or use a Gift Certificate that violates these Terms & Conditions may render the Gift Certificate void. Only ONE (1) Gift Certificate valued at $100, or TWO (2) Gift Certificates valued at $50 may be redeemed per party, per table, even if the party is seated at separate tables and/or receives more than one check. Not valid for taxes, tips, merchandise or prior balances. Gift Certificates cannot be combined with any other restaurant certificates, third party certificates, Gift Cards or other coupons. Gift Basso! Our lineup of edible goodies to go is available now. 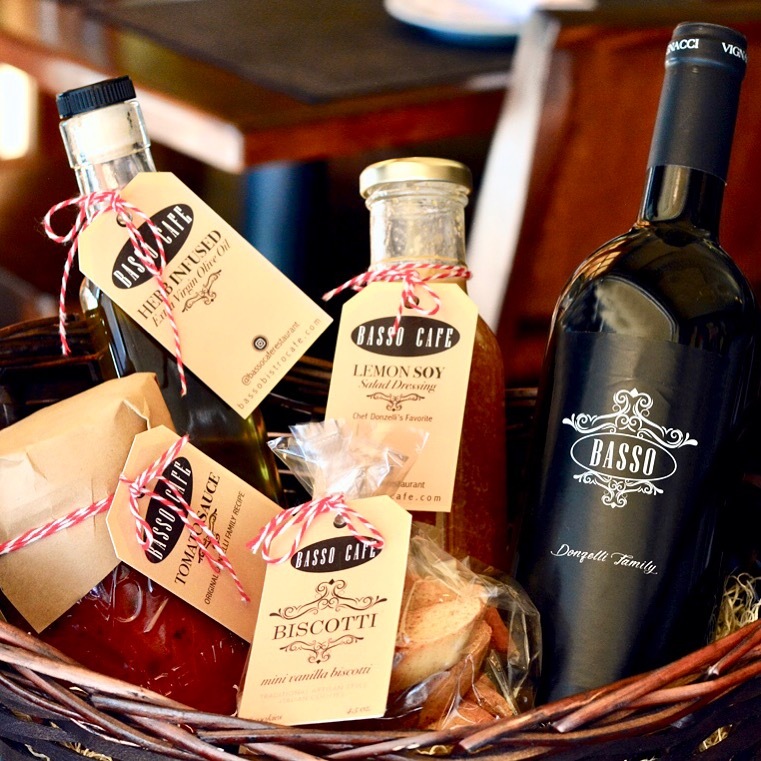 Together in a beautifully wrapped basket; or you pick and choose, purchase them individually at the restaurant. All items are made at Basso by the same team that cooks the meals you love. Always fresh, no preservatives added. please call us at 203-354-6566 with any inquiries, or corporate orders.